State-of-the-art coverage in the 2016 NFPA 72®: National Fire Alarm and Signaling Code® reflects new technologies and applications. The traditional role of fire alarm systems is rapidly evolving. Now, the benchmark for fire alarm systems has changed to give designers, engineers, contractors, installers, and inspectors rules that reflect the current state of the field. 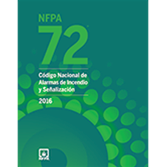 An industry milestone, the 2016 Spanish edition of NFPA 72: National Fire Alarm and Signaling Code has the most advanced provisions ever developed for the application, installation, location, performance, and inspection, testing, and maintenance of fire alarm and emergency communications systems -- including Mass Notification Systems (MNS). New NFPA 72 facilitates interconnections using networks. A special task group on networks addressed the risk analysis, design, application, installation, and performance of networks and networking equipment in fire alarm systems, fire EVACS, and MNS. As a result of their findings, NFPA 72 includes a new circuit designation called Class N pathways permitting the use of networks and Ethernet when interconnecting a fire alarm system. Hundreds of other revisions make the 2016 NFPA 72 indispensable.